Lunch in Germany? What a charming idea! During a brief stay in Switzerland, Diane awakes with a sudden desire to visit Freiburg, Germany. As a London Blitz-baby, I’ve never had much of a desire to see what our bombs did to German towns like this one near the Swiss border, but she is determined, and I naturally agree it is a wonderful idea. The fast train reaches speeds in excess of 155 kph, so the non-stop journey from our base in Basel takes just over half an hour. The attractive lady conductor thinks it very funny that we are just going for lunch. The countryside is fertile, with the Black Forest looming to the East and the nearby hills covered in steep terraces with serried ranks of grape vines. Flat fields of asparagus, maize, wheat, lettuces and other growing things I can’t identify from the speeding train, spread out to the West. We head into the old town, which is easy to find and mere steps from the station. The first thing we notice is the city’s unusual system of shallow gutters which run down the sides of the roads and alleys. The fast flowing water has been diverted from the nearby river and provided refreshment for cattle in olden days, and dogs today. Even in medieval times, using the gutters for sewage was harshly punished. Several shops have chained little floating boats in the current. 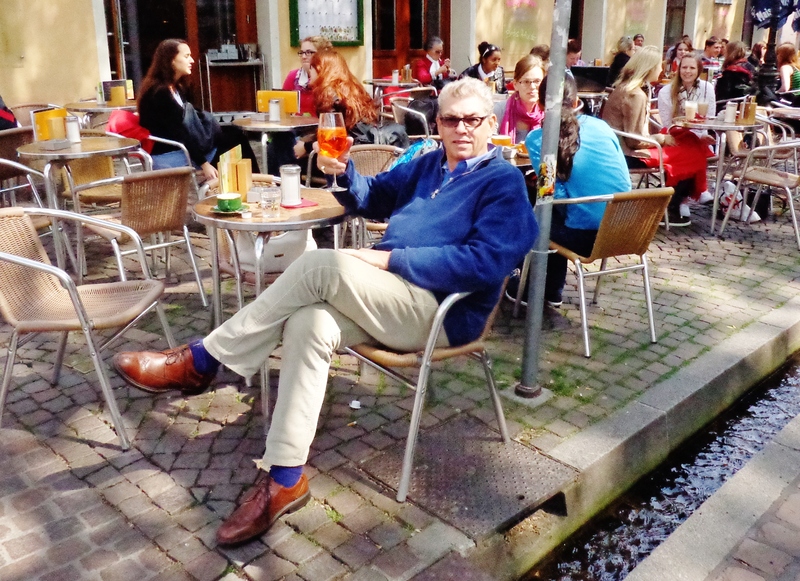 Later, having an Aperol spritz, the latest cocktail fashion in Europe, in a cafe beside one of these bächle, it felt like sitting beside a babbling brook. Our first stop is the Rathausplatz, home to the latest of three town halls: this New Town Hall is actually a 300-year-old university building, bought by the city in 1896 and commissioned in 1901. I love the fact that the town’s leading political building is called the rat house. How appropriate. A newer one is underway and due to open in 2015. I wonder what they will call it? New new rat house? 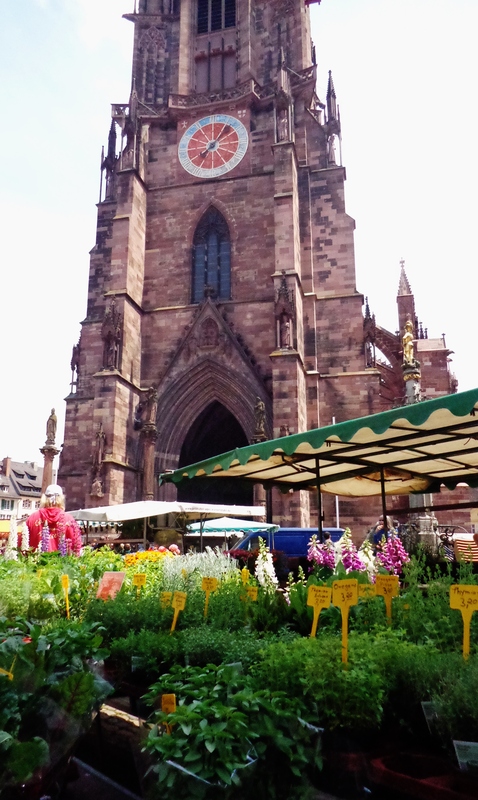 The next square is Münsterplatz, where the gothic red sandstone cathedral built between 1200 and 1530 towers above, with scaffolding at the cap of the spire where repairs are underway. Around the square are copious numbers of merchants’ stalls, many restaurants and beer gardens. Backed by a stall selling bird whistles and another selling every type of brush imaginable, we find Ganter Brauereiausschank where I enjoy a German favourite: schnitzel, which in Germany is almost always made of pork, and brägele, delicious sautéed potatoes with onions. At two o’clock, on the dot, the stalls pack up and we are left with a fine view of the square. We’re sitting beside another historic building, the Merchants Hall opened in 1521. All three buildings share ostentatious and over the top decorations, painted coats of arms and sculptures, and have survived war time bombing unscathed. Other parts of the old town were not so lucky and although they look equally historic, are mostly just rebuilt in traditional style to the old street pattern. After our lunch, we wander the streets, window shopping, people watching and enjoying a fine summer afternoon after a wet start to the day. Our final stop is in a café on the edge of the university district, where we sit with crowds of young people. I have just finished telling Diane how amazed I am that no one seems to expect a tip in Switzerland or Germany, unlike France, say, where everyone’s hand is out. With servers getting a good wage, and the listed price including tax and tip, this is not a tipping culture. We are presented with the bill. It’s only seven and a half Euros, and the young lady asks for cash, but doesn’t offer any change to my proffered 10 Euro bill. I believe I’ve met the exception to my tipping theory. On top of that, she can’t identify where we are on my tourist map. We stroll down the road which we think will take us back to the station, to find ourselves back near the Rathaus. We’re going the wrong way. 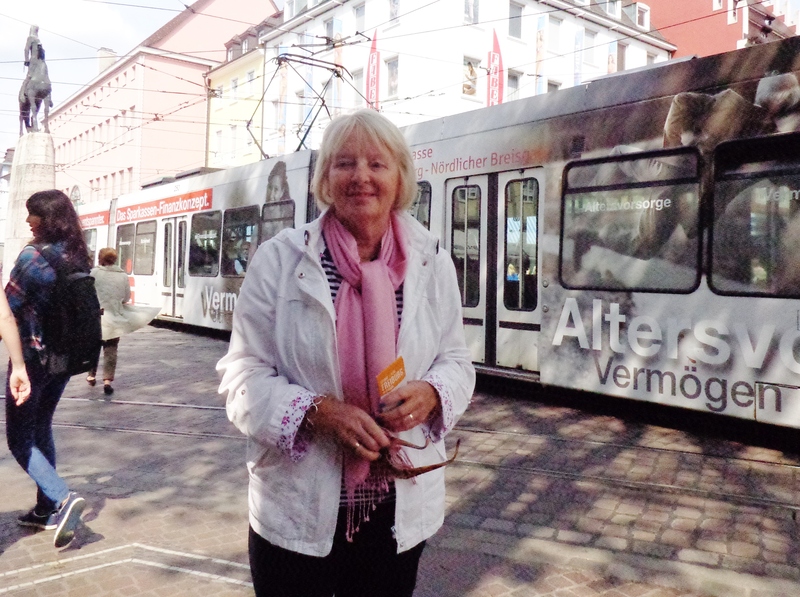 Turning around and grabbing Diane’s hand to cross the street, I almost drag her under a tram. In my defense the trams are going in eight directions at once, and I thought I was on a crossing. A transit policeman gives me a rude warning signal, which I deserve. 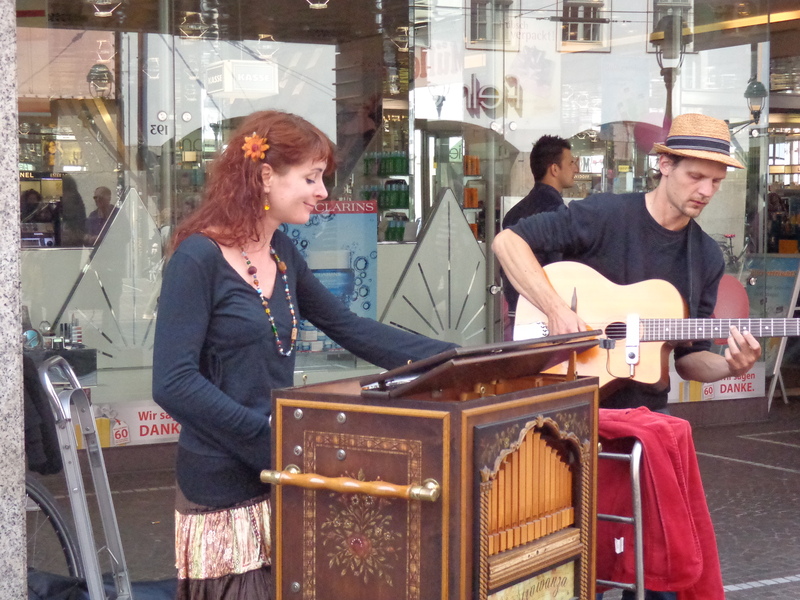 We chill out watching a young woman, with a completely stoned smile on her face, work her hurdy gurdy for coinage. I don’t think she’s been attacked by a tram today. Turns out, there’s no rush to catch our return train. It’s delayed 30 minutes. This article was originally posted on July 2, 2013.